In January, Washington Apple Pi Labs had a short, brief, but much-cherished affair with a Power Mac G5 single-processor 1.8 GHz machine (see Washington Apple Pi Journal, January/February 2004, pp. 17-24). After little more than a week, however, this gleaming aluminum beauty left us. She had astonished us with her charm, her grace, her speed and raw power. We went into mourning. But the mourning was brief. The same benevolent entity that loaned us the first Power Mac G5 foolishly courageously generously loaned us a second, this time a Power Mac G5 with two 2.0 GHz processors. How lucky can you get? This second windfall was not without some confusion. We first learned about the loan when a small brown box, about the size of a trade paperback book, arrived via FedEx. Opening it, we found a note that claimed the cardboard box was a G5, and two memory modules. Holding the box in one hand, one Lab guru commented that it was “amazing how they'd managed to miniaturize the machine.” We assumed, correctly, that a larger box would soon be arriving, and a couple days later one did. Unlike the first G5 we reviewed, this one arrived in a brown box, and the dramatic Power Mac G5 packaging was hidden away inside the more mundane carton. 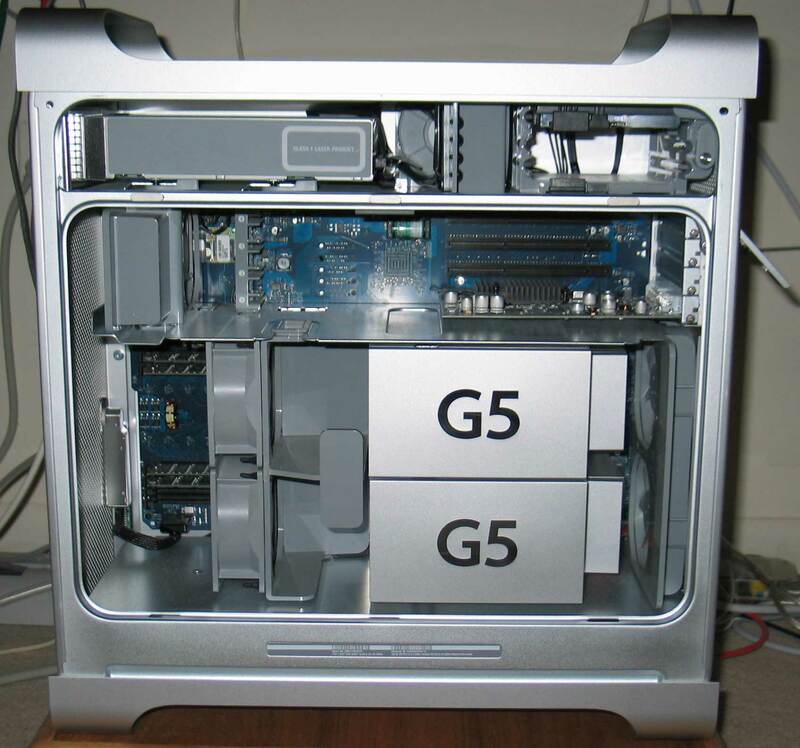 Power Mac G5s were still so rare - especially twin processor models - that Apple had apparently succumbed to pressure from FedEx and UPS and started shipping them in less obvious containers. The next thing we did was plug it into an ancient Sony Trinitron display (the same one used in the first review) and power it up. We immediately checked under the Apple menu for “About This Mac,” and discovered the machine came with Mac OS X 10.2.8, and had 2 GB (two billion bytes) of RAM. Cool! Before we could do anything else, the System Update popped up and prompted us to update some stuff. We tried, but every update failed. At this point, a brief conference of Lab gurus suggested it might be a memory problem. (“Conference” means one person had one idea, so we went with it.) And since our generous benefactor had shipped us two memory modules, why didn't we try substituting them for those in the machine? This worked out surprisingly well: the machine booted properly, it ran System Profiler without any problems, and it ran Disk Utility without any problems. On the down side, the two memory modules proved to be 256 MB each, so we now had 512 MB - one quarter of what we started with. Bummer. This impressive: SETI is just one application, and one that isn't even optimized for the Power Mac G5. Yet in our first try, the dual processor G5 was just shy of 1.7 times faster than the single processor G5 we'd tested earlier, and more than 6.5 times faster than a Power Mac G4/400 of just a couple years ago. SETI work unit times, as mentioned in the previous article, tend to vary, depending on the data being analyzed. But over the course of a week, the dual processor G5 seemed to consistently turn in times of between three and 3 1/2 hours per work unit. We were giving some thought to trying some other processor intensive tasks, but we got distracted by a cat: Panther. We knew we'd have to give up the machine quite soon, and we knew the machine was faster than a single processor Power Mac G5. Further benchmarks seemed pointless. On the other hand, we were curious to see how the G5 worked with Apple's latest operating system, so we decided to upgrade. About this time we got an E-mail that suggested the two 1 GB memory modules we'd removed might work just fine if we left the original 256 MB modules in place and added the higher capacity modules in vacant slots. We tried this, and it worked. We ran lots of test, and it still seemed to work. Exactly why it worked, nobody seemed to know (Apple claims the slots must be used in pairs, but are otherwise pretty much identical.) Now armed with 2.5 billion bytes of memory, we prepared the Power Mac G5 for Panther. After booting from the Power Mac G5 install disk (it came with Mac OS X 10.2.8), we erased the hard drive. We took the additional step of zeroing all sectors. This greatly increases the length of time necessary to format the drive, but it ensures that every byte on the drive is written over and tested. We then did a complete restore of the original Power Mac G5 software distribution, including Mac OS X 10.2.8, Classic, and the various iPhoto, iMovie, iCal, etc., applications. We then booted from the Mac OS X 10.3 Disc 1, and ran Disk Utility to check the drive. The drive claimed it was perfectly happy. We then did a complete install of Mac OS X 10.3, including all the foreign language files, all the programming libraries, Xcode Tools - everything. We doubted we'd need a tenth of the stuff installed, but we had the drive space. We then booted the machine, and had Software Update grab a whole mass of assorted updates. This took the better part of an afternoon (zeroing the drive to test for defects can take a long time, especially with a large drive), so we then decided to, reluctantly, go home. For the next few days, we had great fun playing with the G5 under Mac OS X 10.3. While we could prove, via various measurements, that the dual 2 GHz model is faster than the 1.8 GHz model, in routine use you soon just take the speed for granted. What was more noteworthy was the ease of running concurrent tasks: no matter how processor intensive (or, with 2.5 billion bytes of RAM, memory intensive) the tasks, you could run lots of things at once, and for all practical purposes not worry about one task slowing down another. Sort large databases? Do complex transformations with Photoshop? Crunch down a million points of data in a statistical package? Find aliens? Render video clips? All at the same time? A piece of cake. One obvious problem with such speed: you need more screen real estate. Running several complex programs at once is very hard to do on an ancient 17” Sony Trinitron. A couple 23” Cinema displays, on the other hand, would be perfect. Absurdly beyond the means of most mortals, but perfect. We reluctantly returned the dual 2 GHz Power Mac G5 to its owner. Then we turned to our piggy banks, and dreamed aluminum tower dreams.